"In Casting Off (2007), motherhood becomes a transforming lens on the world. These poems are not sentimental but keenly aware, and full of wonder, discovery, astonishment, and passionate commitment. 'The child inhabits me / like a whelk the whorls of its shell, / a hidden smile. At some level / I am always intimately / accompanied, like holding a lover’s hand / everywhere I go. '” Poems from Casting Off were featured on National Public Radio's The Writer's Almanac and Poetry Daily. 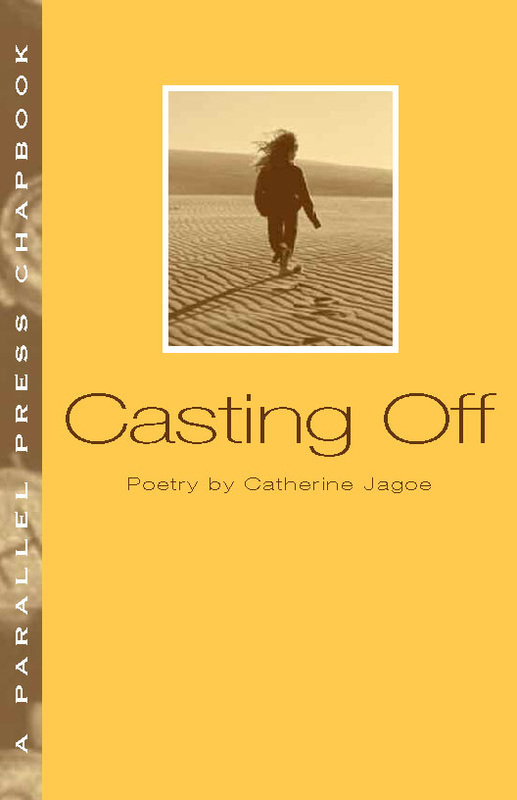 Click here to order a copy of Casting Off from Parallel Press. Free Verse 95 (2008), pp. 47-48.
metaphorical rebirth, and then her experience as a first-time mother, a literal birth. Filling out the chapbook are peripheral pieces related to blending, of people, families, and cultures. the best of Jagoe’s English past with her new life here, via chiaroscuro technique. Cynics might see in this poem a narrator’s wide-eyed naiveté, a glomming onto the romantic’s notion that one can find personal fulfillment just by relocating. Most readers will find instead a delightful wide-eyed wonder, and an immigrant’s robust enthusiasm for the New World. you’ll sound like, look like? so many of these that it’s an embarrassment of riches. Jagoe also has a canny sense of enjambment and pacing, so her long poems easily sustain interest throughout. Plus, a number of poems are worthy experiments in sprawling typography. Here’s an interesting irony. In this book with the writer an exemplar of satisfied motherhood, something in Jagoe’s voice is familiar. Yes, you guessed it: that’s a bit of Sylvia Plath playing in the background, the short declarative sentence, worked with repetition and variation. Good poetry books have a core of focused poems and then others that provide some variety. One such work is “Drafting,” ostensibly about biking but really about what makes a relationship work. It’s one of the loveliest love poems I’ve read in years, and one more reason to buy this outstanding book. Can’t wait to see what Jagoe comes up with next.